Compact Preliminary for Schools second edition is a Fast, focused exam preparation - a 50 to 60 hour course for the A2 Preliminary for Schools exam from 2020. Compact offers intensive revision and practice to quickly maximise student performance. 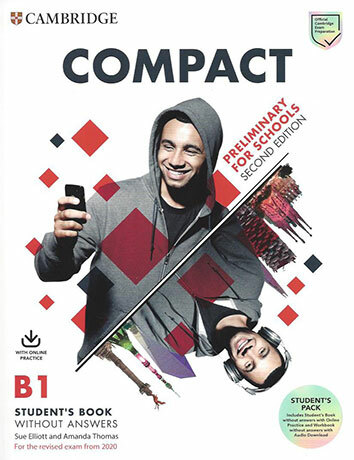 Compact Preliminary for Schools Student's Book offers intensive revision and practice to quickly maximise performance. You will consolidate language and skills for exam success through clear, concise training. Compact help you build confidence with its unique step-by-step approach and teaches essential exam strategies through user-friendly Exam tips. The exam-specific Grammar sections and Grammar reference deepen understanding of language structures, while the Speaking bank and Writing bank extend proficiency in productive skills. The Workbook without answers provides further practice of language and vocabulary introduced in the Student's Book with a six-page section focusing specifically on vocabulary. Online Practice accompanying each Student's Book offers additional practice in grammar and vocabulary. The Downloadable Audio contains the listening material which accompanies the Workbook. Downloadable Class Audio containing the Student's Book listening material is provided with the Teacher's Book. ‘Exam tips’, and grammar and vocabulary exercises teach students to avoid common mistakes identified in Cambridge’s unique collection of real exam papers, the Cambridge Learner Corpus. The exam-specific Grammar sections and Grammar reference deepen understanding of language structures. Speaking bank and Writing bank extend proficiency in productive skills. Online Practice accompanying each Student's Book offers additional practice in grammar and vocabulary. Additional projects in the second edition extend the learning potential for classes with more teaching hours.